The large dog always rides in the back seat area of the pickup truck. 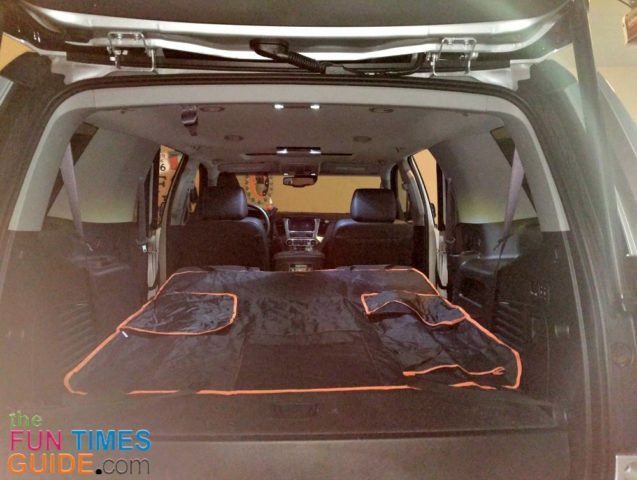 It’s a 4-door extended cab model that perfectly accommodates a large dog (when the back seats are folded up). Our plan has been to use the Chevy Tahoe as the primary dogmobile. We bought it soon after we got the puppies. 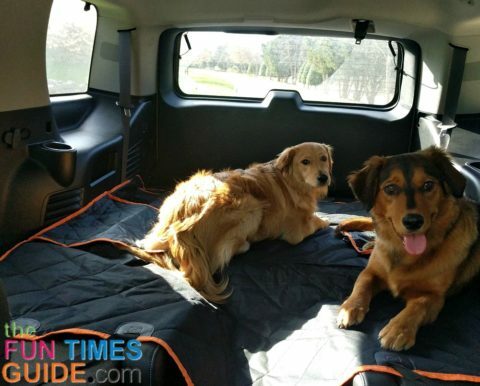 The timing was perfect when the folks at iBuddy asked if I’d be interested in reviewing their dog cargo cover! I only review products that I would actually use and that I honestly see value in — so I thought long and hard before I said yes. My delay was due to the fact that I had never intended to use a dog car hammock. We’re pretty no-frills “jump in and go” dog chauffeurs (aside from a few important dog car safety items). My initial thought was that a dog car hammock would take too much extra effort for our spontaneous car rides and/or it would not be something that I’d want to leave inside the car all the time — since we often have extra passengers whenever we go places. 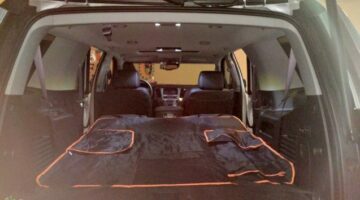 If your SUV has rear bench seats (rather than bucket seats like mine does), then using this dog cargo cover as a dog car hammock would be perfect! I’ve definitely changed my tune on the dog car seat hammock idea. There are extra velcro-closure pockets for holding random small items — like wet ones (for muddy paws), a ball (for playing at the park), etc. Since the 2nd row of seats near the doors in my SUV are bucket seats (and there’s a large, walk-thru area between them — instead of a solid bench seat) I can’t use it as a hammock. 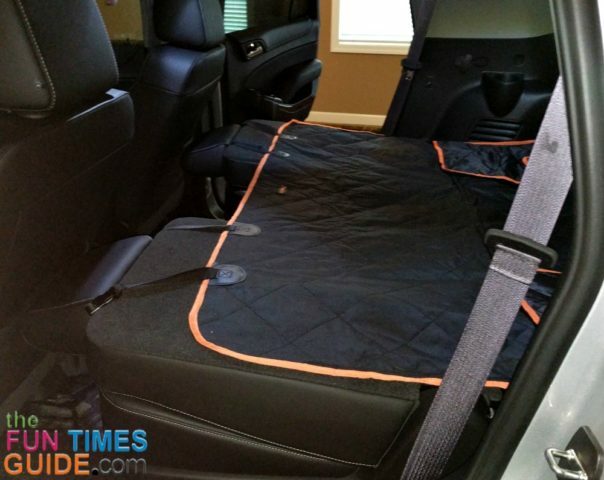 Something like this dog seat protector would be better for covering 2 individual bucket seats that have such a large gap between them like mine. I wish I could use the iBuddy seat cover as a hammock — because many of the “extras” are designed to work best when it’s used as a hammock. 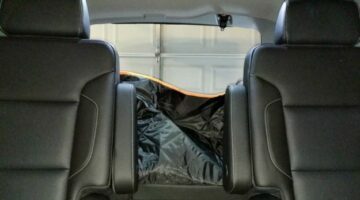 I use it as a cargo cover when all of my rear seats are folded down (including the 3rd row seats). 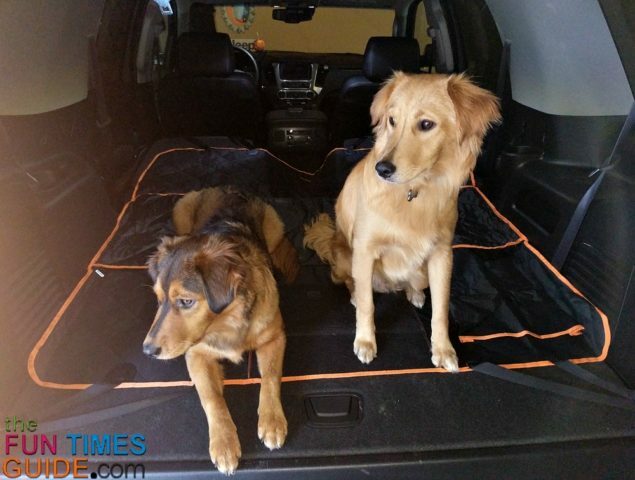 The iBuddy works great as a dog cargo cover because it keeps pet hair from collecting on the backside of the seats! I put the 2nd row seats down. Then I put the 3rd row seats down. 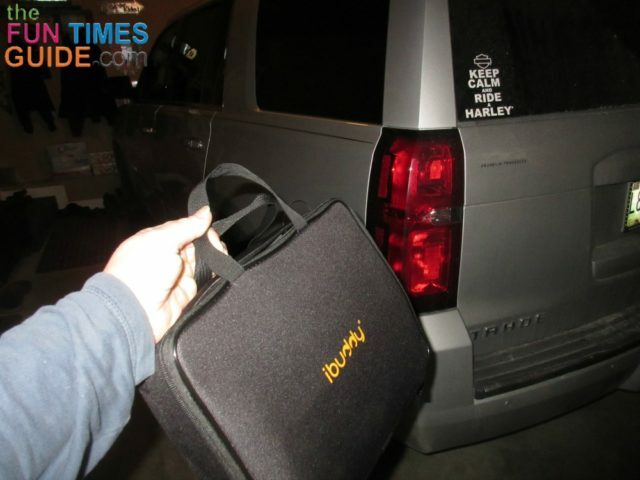 I put the iBuddy dog cargo cover down over the flat seat backs, securing it in place using the quick release clips. The best part: the backs of my car seats don’t collect any fur! Since this is also the area where I tote my groceries from the store, this is important to me. Also, years of experience have taught me that dog fur is next to impossible to remove from the ‘carpeted’ cargo areas and seat backs inside SUVs! 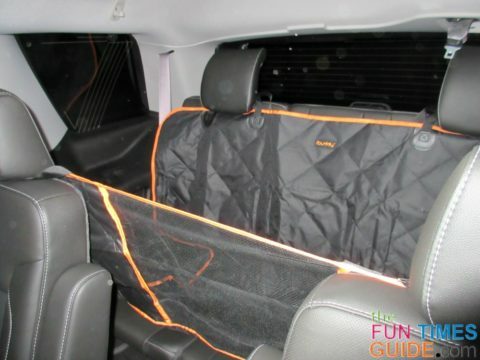 With the iBuddy dog cargo cover, I just quickly unhook the 4 quick-release clips, slide the cargo cover out of the hatchback door, and toss away any dog fur that has collected. It’s super simple. 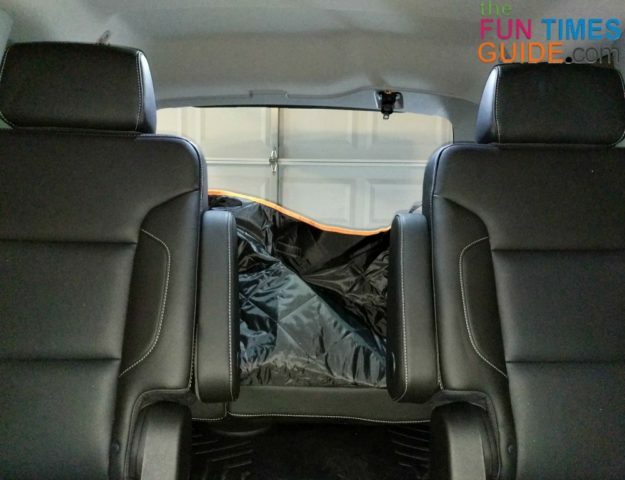 When used as a cargo cover, the iBuddy liner covers that huge gaping hole between the 2 bucket seats in the 2nd row even when the seats are laid down flat, but it will start to sag there if the dogs stand in that “hole” too long. 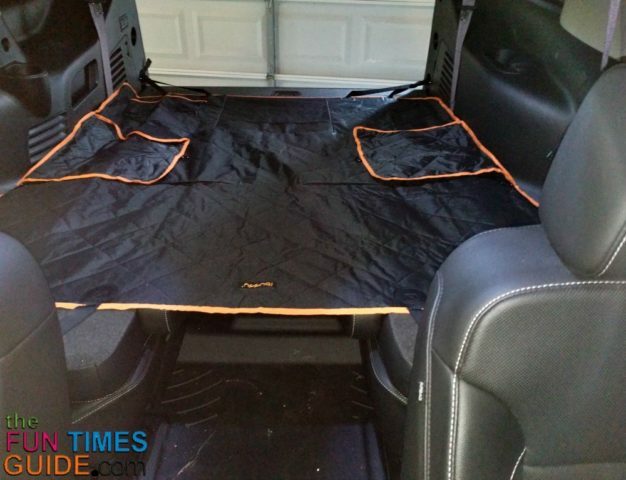 It’s no big deal though — because the cargo liner still stays firmly in place since it’s securely connected in each corner. I use the iBuddy seat protector as a dog cargo cover, but it’s a really great dog car hammock, too! Honestly, I never thought I’d appreciate a dog seat protector (of any kind) as much as I do. I’ve had dogs all my life, and they go pretty much everywhere that I go in the car. I’ve never used seat protector before — but now I wish I’d thought of this sooner. The more I can cut down on dog fur accumulation (and dog drool) inside the vehicle, the better! And now with the backs of the seats being protected from dog fur, I don’t worry about driving other passengers in our car anymore. They can’t even tell we’ve had dogs in the vehicle!